The volcanic island of St. Lucia is a wild, lush and mountainous Caribbean get-away, made even more desirable by the fact that the south of the island offers some of the world’s best conditions for wind- and kitesurfing. The old fishing town of Vieux Fort lies at the foot of a headland that cuts into the Caribbean Sea to the west, and the Atlantic Ocean to the east. On this Atlantic coastline, is one St Lucia’s longest and most unspoilt beaches: Anse de Sable (meaning ‘Sandy Beach’). Almost two kilometers of soft yellow sand, steady cross-shore winds from the left, a reef-enclosed bay of one by two kilometers, that curves slightly into the wind on the leeward end, make Anse de Sable Bay a top location in the Caribbean for windsurfers and kiteboarders. The wind is great, the water provides bump & ride conditions, and the scenery is unmatched with the two uninhabited Maria Islands on the horizon, and the Pointe Sable Environmental Protection Area all around. Distant white caps indicate where a line of coral reef embraces the bay. On very windy days, so-called ‘white horses’ chase after each other, blowing salty breeze on to the tanned skins of sun-worshippers on the beach. This is the home of The Reef Kite + Surf, Beach Cafe & Restaurant, established way back in 1994. A mere fifty steps from the water’s edge – walking through deep, soft, yellow sand – in the shade of white cedar, almond, gum and sea grape trees, you can check out the wind and water conditions, select your gear, while enjoying a frothy hot cappuccino, an icy fruit punch or a thick banana milkshake. The trade winds blow steadily cross (on)shore from the left, dropping off slightly (and conveniently!) over lunch. The shorebreak is usually mild and only when the wind is really blasting do conditions on the water become choppy – choppy enough for some exciting jumps! On the whole, Anse de Sable bay offers perfect conditions for some serious kitesurfing and windsurfing at all levels, from beginners to advanced sailors. 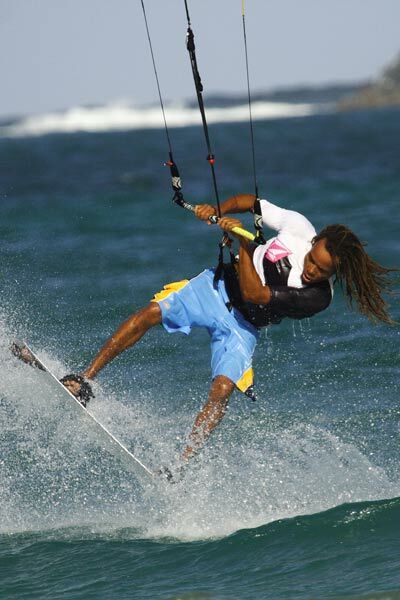 Anse de Sable Bay is truly God’s gift to kitesurfers. Independent kiteboarders and those keen to learn this adrenaline-inducing sport have all the space they need for launching, landing, learning and of course action on the water! Kids watch on open-mouthed as kiters shred over the water near the edge of the beach, get in some serious hang-time, or execute a lightning-fast board change. … and apart from wind and kitesurfing? Well, ‘cooling out’ or ‘chilling’ is a national pastime in St. Lucia, and one which deserves recommendation. This laid-back lifestyle and the predilection for spontaneous partying (known as liming) is more often than not carried out at The Reef Beach Cafe, or at any one of the dozens of rum shops around town and in the surrounding countryside. 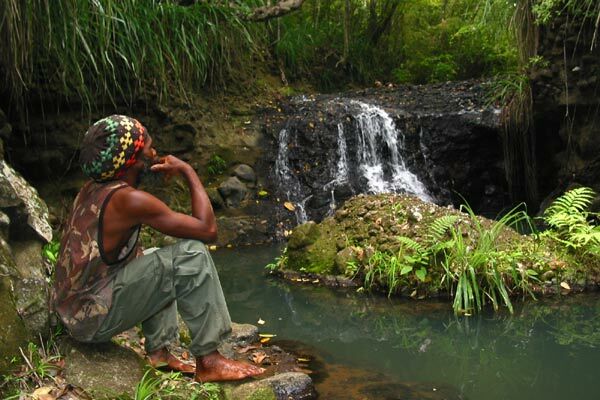 It’s an experience quite unlike anything else you will have seen or done elsewhere in the world: experience how the Original Caribbean lives and relaxes – and we are not talking fenced-in resorts or tourist traps, here! 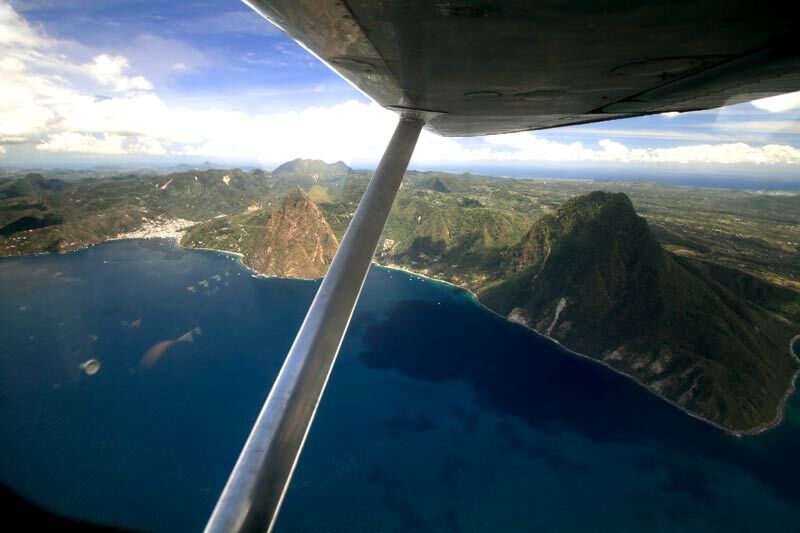 When not liming, there is lots of sight-seeing to be done in St. Lucia. There are the drive-in volcano and and beautiful botanical gardens of Soufriere, an abundance of rainforest trails, coastal hikes, intimate waterfalls, historical ruins of sugar plantations, and of course the rich underwater life waiting to be discovered by snorkelers and divers. The north of St. Lucia offers all the restaurants, nightclubs and street festivals one may expect in a well-developed tourist destination, as well as an 18-hole golf course, whale watching and deep sea fishing opportunities, horseback riding, yachting, sunset cruises, and tennis and squash courts. Back home in the south, the instructors at The Reef Kite & Surf know all the little rumshops, the tucked-away sites and places worth discovering, and from time to time organise barbecues, bonfires on the beach, parties in the countryside, Creole buffets, and other impromptu get-togethers. The centre also has some kayaks and stand-up paddleboards for those incidental windless moments, and of course there’s the ever-popular beach volleyball! Entry regulations: citizens from the European Community need a passport along with a return or onward ticket. American and Commonwealth citizens need to carry a passport, or proof of citizenship, or a birth certificate, photo ID, and a return or onward ticket. A handful of countries do require visas – check with us if you’re not sure. Visitors normally receive a visa valid for 6 weeks, at no cost. Flight duration: appr. 3-4 hours from Miami, 6 from New York, 7 from Toronto, 8 from London, 9 from France, the Netherlands, and Germany. Time difference: CET – 5 to 6 hours. Connections through London from the European mainland can be tight in the morning. We can recommend a pleasant bed & breakfast close to Gatwick airport, which makes travelling so much more relaxed. Airports: The main airport, Hewanorra International Airport (code UVF) is five minutes’ drive away from The Reef Kite & Surf. Air traffic is light and not a disturbance. The second airport, GFL Charles Airport in Castries (code SLU), is 1.5 hours’ away and is mostly used for regional flights. We can organise airport taxi transfers. Health regulations: no immunizations required. Tap water is potable but bottled water is preferred. HIV/Aids are relatively high everywhere in the Caribbean, so precaution is better than cure. Currency/mode of payment: local currency is the Eastern Caribbean dollar (EC$). US$1 = EC$2.67 for cash. Banks: Money can be exchanged at regular banks; official rates are the same everywhere. There is no black market for money exchange. Most hotels and restaurants will accept US dollars, although the exchange rate may be lower (EC$2.50 or EC$2.60). Banking hours are from 8am to 2 pm, but there is a bureau de change at Hewanorra international airport which opens on weekends and late afternoons, and will change money or give cash advances on credit cards. There are also some ATM machines in Vieux Fort town which accept international credit cards. Major credit cards (especially Visa and Mastercard) are accepted at shops and restaurants around St. Lucia. Getting around: Taxis are a popular means of getting around. Drivers are well-informed, friendly and generally polite. Rates are fairly standard, but it pays to agree on a price before setting out. Taxis are not cheap, especially compared to the local buses, but the comfort and reliability are significantly greater. Local buses do not run according to time schedules, and are unreliable after dark and on Sundays and holidays. Rental cars are available from several reputable companies, several of which have booths at Hewanorra International Airport. The can also issue the required local driving permits, upon presentation of a foreign or international driver’s license. It’s free if you have an international license (the grey booklet), or US$22 if you only have your country’s permit. Remember to drive on the left, and drive safely! Local language: English is the official language. Most St. Lucians speak both English and Kweyol (a French-based Creole). Clothing: light, cotton clothing is recommended. During the slightly cooler winter months, you might need a wrap or pullover at night. Long jeans around dusk are the best mosquito repellent! Climate: Tropical, with an average temperature of 27 degrees Celcius (80.6F) and high humidity. Daytime temperatures vary between 27 and 33 degrees (80.6 to 91.4F); nighttime from 24 to 28 degrees (75.2 to 82.4F).